In this article we are going to focus on what is ASP.NET Web API(Application Programming Interface) and why it is needed. The Prerequisites required to learn Web API. Tools to test a Web API service. WEB API is used to create HTTP services. In this article we are going to focus on what is ASP.NET Web API and how to use it. The Prerequisites to learn Web API. It is a framework for creating web API s on top of .NET Framework. It makes creating HTTP service simple and easy and supports wide range of devices. 2. We can use it for a wide range of clients may be a Browser application or a Mobile Device or any Desktop applications. 3. Makes sending/receiving data over HTTP to a wide range of devices very easy. 4. The client can be a service from other language like ruby or python any xaml application or a JS client. 5.Supports data formats such as JSON / XML and allows clients to provide the required response data format. Provision to provide our own data formatting using MediaTypeFormatters. 7.Since it is based on http protocol it also supports caching. 9.It can be hosted in IIS or any exe file or asp.net or unit test project. 10. It uses routing similar to ASP.NET MVC. It is the heart of the Web API application. It exposes the actions or the resources that can be consumed by the client. To provide additional functionality on top of the basic functionality. It is already included with ASP.NET MVC 4. Download and install sp1 for Visual Studio 2010. Good to have knowledge in MVC architecture but not mandatory. Good to have knowledge in WCF data services but not mandatory. Fiddler is a great tool to test Web API services. It also provides the facility to tweak the request headers including the content format we expect from service. Now we will see how to create a simple Web API application using Visual Studio 2012. Here we will create a Web API that returns a list of students. 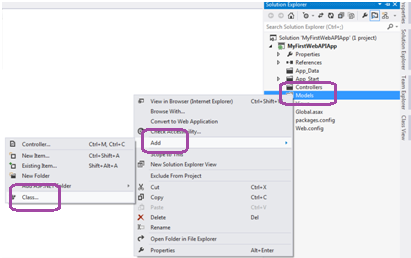 Step1: Launch Visual Studio 2012 -> File -> New -> Project -> On the Left Side of open dialog box Select Installed ->Templates -> Visual C# -> Web -> Then select ASP.NET MVC4 Web Application. Name it as "MyFirstWebAPIApp". Step3: Right click Models Folder and Add new class "Student". 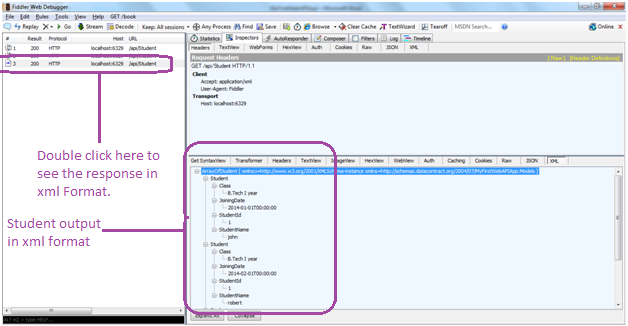 Step 4:Right click Controllers folder and add a new class "StudentController" as shown below. This controller handles HTTP requests from the client. Please note that the controller class inherits from the ApiController class which defines the methods and properties for the web api controller. The configuration settings for the Web API are stored in the GlobalConfiguration object which inturn contains the Httpconfiguration object. 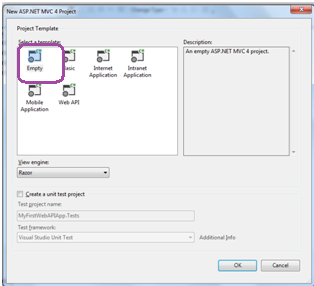 In the App_Start folder there is a WebApiConfig class which is used for Web API configuration. In the Global.asax file, In the Application_Start event,Register method of the WebApiConfig class is used to configure the Web API. It is used to add the default WebAPI route. In the register method, by default it contains the code to route the requests to appropriate controller. Step 5:Build the project and Press Ctrl +F5 to run the project. Now the browser window opens. Copy the url. In the Fiddler Web Debugger window, click on Composer and paste the url(http://localhost:6329/api/Student) as shown below. The port number may vary based on the availability of the port.